The number of births among the Jewish populations of the world is generally found to vary from that of the surrounding population in a manner showing the influence of some cause common in its operations to all Jews. The following table, giving the birth-rate per thousand, seems, at first sight, to show a lower proportion of births among Jews than among the general population of the lands in which they dwell.
" 1888-92 24.5 38.4 Ib.
" 1893-97 22.2 38.1 Ib. Russia 1867 32.6 50.1 "Mouvement"
Westphalia 1824-73 30.1 36.7 Bergmann, ib. This result is surprising in view of the fact that the increase of the Jewish population is almost everywhere greater than that of the general population. It is probably due to the smaller number of deaths under five years among Jews, in consequence of which the non-nubile portion of the population is greater among them than among Christians, and any percentage is less when reckoned on the whole population than it would be if reckoned upon the number of adults only. Thus, according to Körösi ("Die Hauptstadt Budapest im Jahre 1881"), the percentage of Budapest's Jewish population under twenty years was 45, while that of the Christian population was about 34; and it was approximately the same in 1871. Now, if the same proportion held good in 1873, the birth-rate, instead of being 38 per 1,000 for Jews and 43 for Christians, reckoned on the whole population, would be 69 for Jews and 65 for Christians, reckoned on the adult population only. Hence, it is probable that the birth-rate of Jews is only apparently lower, and would actually be higher, if applied only to adults. Ruppin, however, in a recent study of Prussian Jews in Conrad's "Jahrbücher," March, 1902, shows that for Prussia the lower rate is justified, and is due to a change in the social condition and marital habits of the Jews. Baden 1857-63 5.0 4.1 Ib. Prussia, E. 1819-73 4.3 4.2 Bergmann, ib.
" 1867 3.8 5.0 "Mouvement"
Westphalia 1819-73 4.4 4.1 Bergmann, ib. According to Professor Tait, who has deduced the law that the younger the age at marriage the greater the number of children, this fertility is due to the indisputable fact that Jewesses marry earlier than others. A striking confirmation of this explanation is given by the case of Russia, which forms an exception as regards both the earlier age of Jewish marriages and their greater productivity. Other causes of this fertility may be the lower rate of still-births among Jewesses, and the greater proportion of first-cousin marriages among the race. 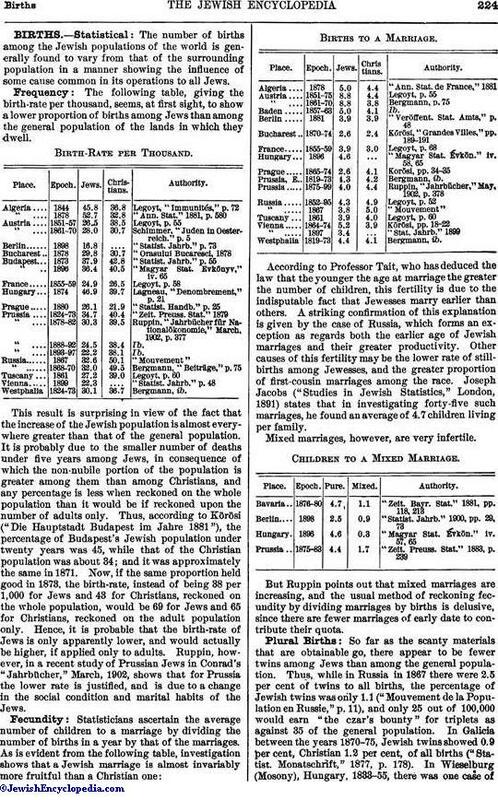 Joseph Jacobs ("Studies in Jewish Statistics," London, 1891) states that in investigating forty-five such marriages, he found an average of 4.7 children living per family. Mixed marriages, however, are very infertile. Children to a Mixed Marriage. But Ruppin points out that mixed marriages are increasing, and the usual method of reckoning fecundity by dividing marriages by births is delusive, since there are fewer marriages of early date to contribute their quota. So far as the scanty materials that are obtainable go, there appear to be fewer twins among Jews than among the general population. Thus, while in Russia in 1867 there were 2.5 per cent of twins to all births, the percentage of Jewish twins was only 1.1 ("Mouvement de la Population en Russie," p. 11), and only 25 out of 100,000 would earn "the czar's bounty" for triplets as against 35 of the general population. In Galicia between the years 1870-75, Jewish twins showed 0.9 per cent, Christian 1.2 per cent, of all births ("Statist. Monatschrift," 1877, P. 178). In Wieselburg (Mosony), Hungary, 1833-55, there was one case ofJewish twin-birth in 174 births; while among the Hungarians the proportion was 1 in 102, and among the Croats 1 in 75 (Glatter "Lebenschancen," p. 13). In Budapest during 1897 40 Jewish twins were born, and this number was less than 1 per cent of the total number, 4,514 ("Stat. Evkönyv," pp. 98, 110, Budapest, 1901). Proportion of Boys to 100 Girls.
" 1859-61 105 106 Ib. The fact was noticed by Burdach at the commencement of the nineteenth century, by Hofacker ("Eigenschaften," 1838), and by Darwin ("Descent of Man," 2d ed., p. 243); but while numerous suggestions have been made, the cause of the predominance has not been determined. The best-known suggestion is that of Sadler and Hofacker, according to which boys are peculiarly the offspring of early marriages. This is to some extent confirmed by Jewish statistics; but the predominance of boys among the Jews is equally marked in Russia, where early marriage is the custom with the general population. It is established that boys are more likely to be born in towns than in the country; and Jews live mostly in towns. Lagneau suggests that the greater number of boys is due to the observance of the laws of Niddah (Lev. xv. 19); while E. Nagel ("Der Hohe Knabenüberschuss der Neugeborenen der Jüdinnen," in "Stat. Monatsschrift," 1884, pp. 183-186) attributes it to (1) the greater care which Jewish wives take of their health, and (2) the smaller number of illegitimate births. The suggestion is that fewer boys die in still-birth among Jews because there are fewer illegitimate births among them. 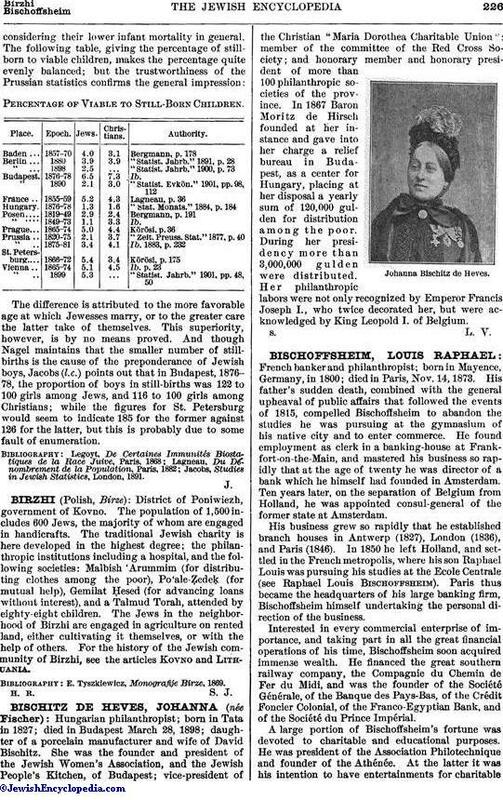 It is probable, however, that the predominance is not so great as it would seem from the table; and, as Lagneau suggests, the abnormal figures for Austria, Russia, and St. Petersburg are probably due to some error in the registration of Jewish female children. The later and presumably more accurate statistics for Hungary and Vienna do not show any marked Jewish superiority. Percentage of Iliegitimate to Total Births. Verona 1855-64 1.0 20.0 Lagneau, ib.
" 1897 13.4 .... "Stat Jahrb. für. 1897"
The high figure for Austria is almost certainly due to the practise of omitting civil registration of marriage among the poorer class of Jews; thus causing their offspring to be reckoned as illegitimate. Thus, at Storozynee, the percentage of Jewish illegitimate children is put at the absurd figure of 99.61, which simply means that the Storozynee Jews never register their marriages. It should be noted, however, that where the isolation of the Jews is being modified, their illegitimacy rate is increasing. Bergmann ("Beiträge," pp. 129-130) shows that there has been a perceptible rise in this rate in most of the eastern districts of Prussia; and where a diminution has occurred as in West-phalia, it has been less than that in the general population. Number of Viable Boys to 100 Girls in Iliegitimate Births. Percentage of Viable to Still-Born Children. Budapest 1876-78 6.5 7.3 Ib.
" 1849-73 1.1 3.3 Ib. The difference is attributed to the more favorable age at which Jewesses marry, or to the greater care the latter take of themselves. This superiority, however, is by no means proved. And though Nagel maintains that the smaller number of still-births is the cause of the preponderance of Jewish boys, Jacobs (l.c.) points out that in Budapest, 1876-78, the proportion of boys in still-births was 122 to 100 girls among Jews, and 116 to 100 girls among Christians; while the figures for St. Petersburg would seem to indicate 185 for the former against 126 for the latter, but this is probably due to some fault of enumeration. 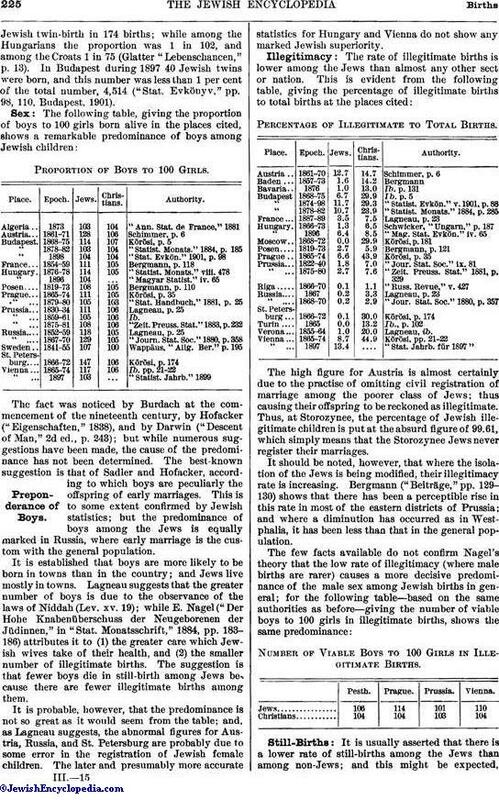 Jacobs, Studies in Jewish Statistics, London, 1891.